VERY GOOD CONDITION. USED OCCASIONALLY , VERY CLEAN . 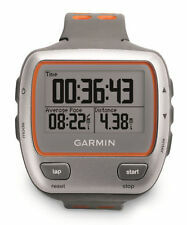 Garmin Forerunner 110 GPS enabled sport watch. In original box. With USB charger and instructions. Excellent condition. Condition is Used. There are a few marks on the face as closely pictured, but hey this is a supposed to be an outdoor activity watch. This does not impact on functionality. I have owned this watch for about a year and a half and used it daily. I have just upgraded to the Garmin Vivoactive 3. I have tried to display this properly in the images. Polar RC3 GPS Heart Rate Monitor and Sports Watch with chest sensor. Used, but fully functioning condition. Some cosmetic marks. Dispatched with Royal Mail 1st Class. Garmin Vivoactive HR Smartwatch GPS Sports Watch. Hardly been used. A few very light scratches on the front which are hardly noticeable. Extremely good sports watch that cost over £200 new a few months ago. Easy to use and works with Apple Health App. The first is VO2 Max which gives you an estimation of your actual fitness based on your performance and heart rate data. Get even more information from Fenix 3 by combining it with one of the many optional Garmin ANT sensors like Vector for cycling power, tempe for temperature, HRM-run (not included) for running dynamics and heart rate and many more. Garmin Vivoactive HR Smartwatch GPS Sports Watch. Used once but doesn’t fit wrist, hence sale. As new condition. Comes with charging cable. Dispatched with Royal Mail 1st Class. Condition is Used. This watch is in perfect working condition and has always had a screen protector fitted. It does has a few scratches on the surround which I have tried to capture in the picture. The first is VO2 Max which gives you an estimation of your actual fitness based on your performance and heart rate data. fēnix 3 is designed to assist people during their sport activities and outdoor life. Condition is Used. This item is in used condition, and I have tried my best to capture all the scratches and marks that are around the Watch face. Condition is Used. H a p p y b i d d i n g.